Marketers are getting confused by marketing in a digital age. To understand the benefit of brand equity in a digital age, we need to clarify what it means in terms of the way that people decide. Let’s start with Prof. Kevin Lane Keller succinct definition of brand equity, “the differential advantage from knowing the brand.” If you think brand equity means you are the only brand someone would buy, you are looking for the wrong thing. Brand equity is an edge (small or large) based on brand familiarity associated with a relevant context. But in an era of self-directed consumer purchase journeys, an edge is actually a lot. You’d go to Vegas with odds tilted in your favor like that. Consumers live in a world of a long-tail of choices…hundreds of channels where we used to have half a dozen, unlimited items in stock online rather than only what fit on the shelf, hundreds of sources of information not just those stores we can visit or friends we can talk to. So what do consumers do in the face of unlimited choices? Just like the behavioral economists tell us, the first thing consumers do is choice reduction in everything they do. The familiar and trusted brand might not be the only option but it is one of only a few choices that are SEEN in any context at any stage in the journey…in search pages, on Amazon product pages, on store shelves. That’s big. So net/net…a brand is a simplifying heuristic…the grand-daddy of all at simplifying choices. Brand equity can even be thought of as the percent of purchase journeys for whom YOUR brand plays a simplifying role. And when your display ad pops up on a web page, it is more likely to be seen there too. And that brings us to why even the media data scientists should care…they are trying to maximize response to ads but …most just don’t realize that brand equity is one of their biggest weapons because they do not have a consumer dynamics background nor reflect it in their modeling. Now extend that finding even further…bigger brands have more people who feel that way about the brand. That’s because the most fundamental law in marketing is that brands must have more loyals and more switchers whose group sizes are commensurate with brand size. If you are a big enough brand to have a large enough segment to target programmatically, you can really drive ROAS through the roof (ping me for white paper). So, for the benefit of media pros focused on maximizing short term effects, let me paraphrase our brand equity definition…brand equity is the differential response to advertising from knowing the brand. In fact, brand equity might be your best media weapon if you leverage it right with precision targeting. 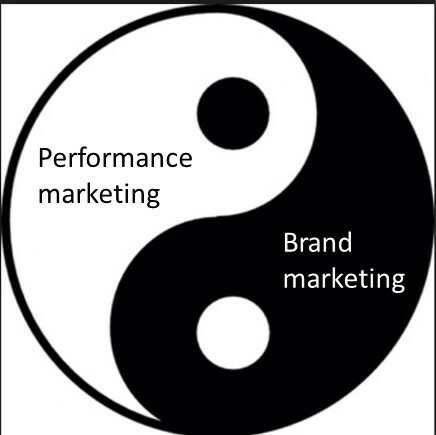 Now where does brand equity come from? That is where brand marketing comes in to tell your brand story, carefully crafted to be meaningful to a consumer in a given need context. Your next step in managing the ad budget is to figure out how to BALANCE short term performance marketing with brand marketing…a problem I am currently working on with industry leaders to inform. It creates a data exhaust of first party data (sign-ups, app downloads, etc.) that becomes a runway for highly successful marketing tactics. thanks Art. this principle of ad responsiveness as a function of brand size is unknown to most…as is the relationship of brand loyalty and price elasticity. We know the principle from our Hendry days but it is nice to know that evidence from modeling in a digital age proves the truth of these principles and makes it more actionable by showing how the principle operates at a targetable segment level. All correct, except that brand equity is NOT the differential response to ADVERTISING. You did not paraphrase Keller, you inserted “advertising”. Think Uber, Tesla, Airbnb, Google or Amazon or Netflix. Have these brands been built on advertising?